Take a look at this short video [language warning]. It’s a woman attempting to cycle along Upper Thames Street, and having to come to a stop as two HGVs barrel past her, at speed. You can actually hear the fear in her voice. This was of course back in 2011. This section of road looks very different now. The lane in which the two HGVs thundered past the frightened woman has been replaced by a protected cycleway. The post box where she was forced to come to a halt is visible in the photograph above, with a father and his young son cycling past it, side by side. It’s precisely the same location. There is an HGV in the background of the photograph, but it won’t come anywhere near these two. The contrast is total. There is a cliché of cycle campaigners being angry, or aggressive. That we froth, won’t compromise – that we are fanatics, or ‘militant’. While I tend to resist these kinds of lazy stereotypes, I think the juxtaposition between the scary video and the present-day situation on Upper Thames Street goes a long way towards explaining why we might come across this like this. We are scared. We are frequently put in intimidating or dangerous situations, not through any fault of our own, but through the indifference of highway engineers and politicians, and (very often) the people driving motor vehicles that we are forced to share the roads with. It doesn’t take much searching to find these kinds of incidents on social media. Riding home from Manchester last night in mental traffic, passed female cyclist sadly wheeling bike on pavement, "fed up of being beeped at"
Even as I write this now, similar kinds of incidents are popping up in my timeline. Near death experience. Cycling down to the station, in the wet, car driver sees me coming but turns right across in front of me. I jam my brakes on and miraculously manage to slide both wheels around his car. “But I was indicating!”. Oh yes, I was wearing hi-vis – makes no diff. Near misses are an everyday experience for people who cycle, and – tellingly – they are experienced more frequently by women, and people who cycle more slowly. Cycling speed is the main factor affecting near miss rates: those who reach their destination at an average speed of under 8 mph have around three times more near misses per mile compared to those who get there at 12 mph or faster. So we are scared. And we want that this fear to go away. We don’t want our journeys to be punctuated with near-death experiences, or fraught with danger and hostility. We’d also like to see our friends and family able to accompany us when we travel around, and not see their horizons limited. We’d like them to experience the freedom we enjoy, and not be forced into using less convenient (and objectively more dangerous) modes of transport because of fear. So when we seem to get angry, or ‘militant’, with people who oppose engineering schemes that would replace danger with safety, it’s not for the fun of it, or because of any inherent flaw in our nature. It’s because that opposition has consequences. It means people trembling at the side of the road, swearing uncontrollably, as vehicles thunder past them. It means people continuing to be seriously injured or killed on these roads. It means our day-to-day trips are much more scary and unpleasant than they need to be. It means that people who want to cycle can’t. That’s why we’re angry. We don’t tolerate it with other modes of transport. We expect to be able to use buses or trains without visceral fear, or having to glance over our shoulder as someone pilots a vehicle that could easily maim or kill with a minor error or misjudgement, within inches of us. We shouldn’t tolerate people having to give up using a mode of transport because of fear, or people not being able to use a mode of transport they enjoy, because of fear. So if you think that we’re angry, at the very least reflect for a moment on why that might be the case. There was a bit of back-and-forth on social media last week on the subject of Exhibition Road, involving – in particular – the Conservative councillor Daniel Moylan, who had a major role in pushing the ‘shared space’ scheme through. One of his tweets was – for me at least – particularly intriguing. I think I would rather hide in a cave than adopt “Sustainable Safety” principles. Fairly clear! But why might a fan of ‘shared space’ be so hostile to Sustainable Safety – the policy which lies behind the Netherlands world-leading road safety record? After all, the Netherlands is the country where Moylan’s version of ‘shared space’ largely originates – with the ideas of Hans Monderman. If we look at the principles of Sustainable Safety, the answer quickly becomes clear. The ideology behind Exhibition Road (and Moylan’s attitude towards how it should function) stands almost directly in opposition to those principles. Let’s take the first principle – Monofunctionality, or Single Function Roads. There should be no ambiguity – a road should either have an access function, a distributor function, or a through-road function. Since the early 1990s, when Sustainable Safety originated, The Netherlands has been busily classifying their road network, and adapting their roads to ensure that they function according to their classification. In particular, access roads must not have through traffic using them. They are places where people live, work, shop – where they engage in everyday human activity. Flows of through traffic should, quite rightly, be separated from these activities. Exhibition Road, of course, doesn’t fit neatly into this typology. It very obviously has through traffic on it, exemplified by the long queues of motor traffic at either end. But at the same time it has the pretence of being a place – a ‘cultural heartland’, a destination for tourists and visitors to London. So it’s a curious hybrid of public space, where people gather, and a busy through-route for motor traffic, with something like 13,000 motor vehicles per day at the northern end, and around 8,000 per day at the southern end. Public space – a genuine destination – or a through road for motor traffic? Under Sustainable Safety principles, this isn’t acceptable – something should have to give. Either through motor traffic should be restricted (with access still allowed for residents), with Exhibition Road becoming a genuine access road, or alternatively the design of the road should be altered to more explicitly reflect its function as a through-route for motor traffic. At present, Exhibition Road is a through-road dressed up like an access road. The second principle of Sustainable Safety is homogeneity of mass, speed and direction. Again, this is a bit of jargon, but what it amounts to is that, on roads and streets, we should try to only mix things if they are of similar mass and speed, and if they are travelling in the same direction. If we can’t do this – for instance, if we can’t ensure that things are all travelling in the same direction, like on a motorway – we should try to ensure that mass and speed are equalised as much as possible. Applying this principle to Exhibition Road, we find that we shouldn’t be mixing low-mass objects like human beings with heavy mass objects like coaches, buses and lorries (and to a lesser extent, vans and cars). These kinds of large mass vehicles shouldn’t really be on the kind of street where there are many people milling about. And if they do have to be there, we should be careful to make clear which mode belongs where, and to separate them as much as possible. Yet this is of course the exact opposite of the ‘shared space’ ideology that lies behind Moylan’s vision of Exhibition Road – namely, that the distinction between low mass objects like human beings and have motor vehicles should be deliberately blurred, apparently to create uncertainty, and to foster ‘negotiation’ between people walking, and people piloting large vehicles. This is even in the face of evidence that the vast majority of people simply don’t want to ‘negotiate’ with those large vehicles. While it is arguable the the design of Exhibition Road may slow motor traffic more than the previous road design – which had pedestrian guardrail – in other respects it stands in direct opposition to the homogeneity principle. The third principle of sustainable safety is that road design should be instantly recognisable. By this stage you will of course not be surprised that this is the direct opposite of the impression created by the design of Exhibition Road. It attempts to looks like an access road where people should be driving very slowly and carefully, yet has a through road function, with plenty of motor traffic moving in a straight line down the road. The impression for all users is one of confusion, rather than clarity (and again, this is an apparently deliberate hallmark of this ideological form of ‘shared space’). Instantly recognisable road design should be predictable, and not spring surprises on users; it should have clear and consistent design types, rules and markings. This doesn’t fit at all with Exhibition Road, where a through road is composed of unusual and ‘uncertain’ design elements. The fourth element of Sustainable Safety is Forgivingness. This principle acknowledges that human beings are fallible and that we will make mistakes, and indeed that sometimes we will deliberately break rules. Our road and street environments should therefore be designed to accommodate these mistakes and rule-breaking, without serious consequences. The first [principle of shared space] is to do with respect for other people, and acknowledging their rights and their autonomy, their responsibility to make sensible decisions for themselves and in relation to others. Sustainable Safety, quite sensibly, doesn’t take this benign view, and builds safety into our road environments by recognising that we human beings will often make mistakes, and make flawed judgements, rather than relying upon our supposed good nature and responsibility. Finally, the fifth principle of Sustainable Safety is State Awareness. In short this amounts to education of users to ensure that they are familiar with rules and how they operate, but it also includes the recognition that not all human beings are the same. Some may be more prone to risk taking; some not so good at processing information, determining speeds, and so on (e.g. children, the elderly). The environment should align with these capabilities, rather than with those of some idealised human being. This is particularly important if the ‘task demands’ being loaded onto a user exceed their capabilities. A good example might be someone who is tired, or ill, attempting to drive across a junction that is needlessly complex. The risk of collisions will obviously be increased if the demands being placed on a user – in the form of multiple interactions having to be dealt with and processed in quick succession – exceed their abilities. While conventional Dutch road layouts aim to simplify and reduce the number of interactions that have to be dealt with at any time, applying ‘shared space’ on busy roads, with many different types of objects moving in different and unpredictable directions at different speeds, will challenge the ability of people to process information and adjust to it. Again, we see that ‘share space’ of the Moylan form doesn’t sit easily with Sustainable Safety. So there we have it! I hope that’s a reasonably clear explanation of the principles of Sustainable Safety and why it stands opposed to the ideology behind Exhibition Road. You can read more about Sustainable Safety on the Cycling Embassy blog, on the Bicycle Dutch site, and on A View from the Cycle Path. I write regarding your recent comments on social media regarding the cycling infrastructure around Parliament Square. You have asserted that more people are choosing to use the road instead of the cycling infrastructure, and in doing so imply that, as a consequence, there was little point in building that cycling infrastructure in the first place. I fear that – regardless of the numbers involved – your comments might betray a failure to understand the reasons behind people avoiding that infrastructure, and that in turn could lead you to erroneously dismiss the utility of separating cycling from general traffic at this location, and indeed at other locations across British towns and cities. Given the importance of your role as Chair of the National Infrastructure Commission, I hope you will forgive me if I seek to explain to you why cycling infrastructure of the kind in question remains essential even if some choose not to use it, and also what we can learn from a minority of people failing to use a specific piece of infrastructure as intended. In the last decade, there have been sixteen KSI (killed or seriously injured) incidents involving people cycling in Parliament Square, and along the section of road running past the Houses of Parliament, alone. Every single one of those incidents is a personal tragedy that could have been avoided by separating those people from the motor traffic running through the Square. The new cycling infrastructure achieves this. It greatly increases the safety of people cycling here by removing entirely any interactions with motor traffic. To take just one example, I have seen families with young children cycling through the Square in complete safety; something that would have been totally unthinkable before this infrastructure was built. I hope you will agree with me that the failure of some people to use this infrastructure should not – in any way – be used as a reason to take those safe conditions away. There is a great deal of point to this infrastructure in safety terms alone, without even considering its importance in enabling cycling as a mode of transport for people unwilling to cycle at present, with all the concomitant (and significant) benefits in terms of public health, congestion mitigation, and pollution reduction. When it comes to the matter of a minority of people choosing to use the road instead of the cycling infrastructure through the Square, I’m afraid the explanation is rather obvious, so again forgive me if I am telling you something you already know. (I’m prepared to take that risk to ensure that someone in your influential position is fully appraised of the facts). If one is cycling in an eastbound direction across the Square, there is, unfortunately, a significant amount of delay at each set of traffic lights on the cycleway – typically it will take two or three times as long to negotiate the Square compared to using the road, a delay of several minutes. I don’t think it should be very surprising, therefore, that some people will naturally choose to avoid that delay by using the road instead, especially given that many of these people will have cycled on equivalently hostile roads as part of their daily journey. (As I hope you know, cycling infrastructure in London is far from ubiquitous). These people are not wilfully choosing danger over safety – they have merely chosen to save time. By analogy, if we see people choosing to dash across a busy road instead of walking several hundred metres out of their way to use a pedestrian crossing, I trust you will agree with me that we shouldn’t respond by questioning whether pedestrian crossings are useful, or whether there is any point building them. No – an appropriate response is to build pedestrian crossings where people actually want to cross, so they aren’t forced to choose between danger, and inconvenience. In precisely the same way, if you are concerned about the safety of people cycling (and indeed concerned with enabling more people to cycle), an appropriate response to the issue you raise in Parliament Square has to involve increasing the convenience of the cycling infrastructure there, rather than questioning whether it should even exist at all. Nor should we attempt to pass new laws compelling people to use inconvenient walking and cycling infrastructure. If we are serious about enabling these modes, we should be designing environments where convenience and safety directly, and naturally, align, rather than attempting to compensate for poor design with regressive laws. In this context, I must emphasise that the new cycling infrastructure built by Transport for London in recent years is of a high standard and does, in general, pass this test. Over 90% of users are indeed naturally choosing to use the cycling infrastructure in preference to the road, because it offers them both convenience and safety. I would be interested to see your figures for Parliament Square, not least because it will be a useful way of identifying the degree of inconvenience there. There’s a problem on the Superhighway in central London. Users are dodging the infrastructure that was created specifically from them (and to keep them safe), simply in order to avoid traffic lights. It’s an all too common problem – should we even allow these people to do this? Do we need to pass a new law to force them to use their own infrastructure? You won’t need me to tell you that I am of course talking about walkists. Or – to use the more conventional term – ‘pedestrians‘. Near the Charing Cross bridge, the Walking Superfootway that runs along the Embankment – created specifically for pedestrians, and at great expense – crosses from the Thames side of the road, over to the pavement on the other side of the road. There’s even a detailed plan showing pedestrians exactly how this works. (So there’s no excuse for them not to use it). Pedestrians should simply follow the yellow line, using the three pedestrian crossings – built specifically for them, for their own safety – to cross the road on one side, before using three pedestrian crossings to cross back again. Simple! They only have to wait several minutes to do so, hardly a great inconvenience compared to just walking along the river without any delay at all. Yet despite this clear, obvious route for pedestrians to follow, many of them simply refuse to use the walking infrastructure provided for them, and instead choose to dangerously mix with cycling, on the cycle road. Pedestrians are using this bit of cycle road, instead of using the specific Pedestrian Superfootway walking infrastructure. What is wrong with these pedestrians? Some people have argued that they are dodging the infrastructure built specifically for them because they want to avoid a lengthy series of traffic lights and a route that takes them out of their way. But that can’t possibly be the explanation. These people are simply irrational. Either that, or they are making some kind of point – they’re militant, self-righteous pedestrians, deliberately trying to hold up cycle traffic, instead of using the perfectly good walking path that has been provided for them. Specifically. And at great expense. Now here’s the thing. In an intriguing parallel, it seems that cyclists themselves are also dodging the infrastructure built for them at great expense – a Cycling Superhighway, if you will – simply in order to avoid some traffic lights. Just like the militant walkists. Again, these people must be simply irrational. Or if not, they are self-righteous, militant cyclists, making some point or other, or deliberately holding up motor traffic because they derive some sadistic kind of personal satisfaction from doing so. Clearly, the only way to deal with these problem walkists and cyclists is to pass a law to force them to behave rationally, instead of irrationally. design our road environments so that convenience and safety is aligned, rather than forcing people to make a choice between convenience and safety. All that would far too longwinded and time-consuming. Much, much easier to just create a new law to force all these irrational human beings to behave in the ways we want them to behave! …. Naturally if Lord Adonis does want to talk to me about understanding behaviour and responding to it in a productive way, I’m more than happy to engage with him! An old post from Joe Dunkley that resurfaced yesterday in the wake of some comments about Christopher Chope – a former transport minister in the Thatcher government and helmet law enthusiast – has prompted me to reflect on some of the intrinsic problems with ‘shared use’ footways. The history of ‘shared use’ is itself rather murky, as that post from Joe Dunckley explains. I understand the “cycle tracks” — that is, crappy shared pavements — that [the Thatcher government] introduced in the 1980 Highways Act were not intended to encourage and enable cycling, but to improve road safety by getting cyclists out of harm’s way while the poor things saved up to buy a car of their own. 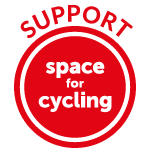 This is a good explanation of the background assumption behind the Act – namely, an assumption that cycling was an insignificant mode of transport, one that would either remain insignificant, or disappear completely. The intention of this 1980 Act – which allowed footways to be converted to ‘shared use’ – was clearly not to improve conditions for walking and cycling. Instead it rested on the belief that cycling was so negligible it didn’t deserve its own space, and could just be ‘added’ to the walking environment, presumably until it vanished out of existence. Of course this brings us to the basic problem with ‘shared use’. It’s a design philosophy that is based around an assumption that cycling is, and will remain, a tiny mode of transport. ‘Shared use’ isn’t future-proof. Anywhere it is implemented in urban areas, in preference to designing for cycling in a space separated from walking (be that cycleways, or low-motor traffic streets) amounts to a prediction that negligible, current, cycling levels will remain negligible. And indeed, it’s largely a self-fulfilling prophecy. The inconvenience of using shared use footways, coupled with the conflict with people walking that results, serves to actually suppress cycling levels – a point made in this post from New Zealand. Shared paths are The Hunger Games of urban transport. Pedestrians and cyclists are thrown together in a hostile environment to fight over the breadcrumbs left by cars and see who survives. They are effectively a self-sabotaging form of infrastructure. The more popular shared paths become the worse the level of service gets for both modes, which then undermines uptake. There’s – quite literally – no space for growth in cycling on shared use footways. To illustrate this, we can look at environments where cycling was formerly accommodated on a shared use footway, but now has its own space. For instance, on Lower Thames Street. There ins’t a huge number of pedestrians walking here, but combining the current levels of cycle traffic – greatly increased following the construction of CS3 – and the current levels of walking on that footway would clearly be a recipe for enormous conflict. Only with sufficiently wide, separated space for each of these modes will we see any growth in cycling. ‘Shared use’, in an urban context, is self-suppressing. In choosing to employ ‘shared use’, highway engineers and planners are assuming that cycling will remain a tiny mode of transport. It represents a continuation of that 1980s belief that cycling wasn’t worth bothering with, and indeed that 1980s hope that it actually disappears. Cycling needs its own space if suppressed demand for it is to be unlocked – ‘shared use’ certainly isn’t that space. The Royal Parks agency in London has a bit of an issue with cycling. The actions it takes – whether it’s adding cobbled speed humps to popular cycling routes in Hyde Park, or attempting to remove a popular cycle route from that same park, or chasing after a cycle taxi service – give the impression of an organisation that views cycling as something a bit… undesirable. For the Royal Parks, cycling is a problem to be managed, rather than an opportunity, and it appears to be actively trying to discourage it. What’s even more unfortunate is that the policies the Royal Parks are implementing to manage this ‘problem’ are actually making the Parks worse for everyone, whether they are cycling or not. A sensible strategy for managing cycling on the existing routes in Hyde Park would be to separate walking and cycling from each other, and to give each mode plenty of space, so they are not coming into conflict with one another. Indeed, we can see this policy working well on a number of routes in and around Hyde Park, already. We can see it on South Carriage Drive, where the new cycle ‘Superhighway’ runs alongside a footway. Here people can walk and cycle, without getting in each other’s way. They have their own clear, distinct space. Likewise on West Carriage Drive, where the same ‘Superhighway’ runs in parallel to walking provision. People walking on the left; people cycling on the right. People walking can do so at leisure, knowing that anyone cycling will not be anywhere near them. The situation is similar on Rotten Row, with separate walking and cycling space. This is the route that the Royal Parks want to ban cycling on, following the construction of the ‘Superhighway’, but the evidence suggests – as in the photograph – that this is still a popular route for cycling, despite that new route. There isn’t a great deal of conflict between walking and cycling here, but if there is, it should be addressed by creating wider, separate space for each mode, not by banning cycling altogether (which at the very least creates issues for people who use cycles as a mobility aid, depriving them of access). We also see separation of walking and cycling on the (newly widened) Constitution Hill route. Formerly, cycling and walking were crammed together (albeit separated by markings) on the path to the right. With the new path on the left, both modes have adequate space, and do not come into conflict with each other. It’s notable that despite absolutely minimal distinction between these two paths, either in terms of signs, or markings (perhaps a deliberate Royal Parks policy), people are naturally opting to walk where other people are walking, and to cycle where other people are cycling. In other words, the natural choice of human beings is to avoid conflict, and to seek out space that is being used by people that are travelling in a similar way to them. Yet the policy on the Broad Walk in Hyde Park stands directly in opposition to the way people naturally behave, and what they actually want. This path used to have a painted cycle route on one side of it – dating back to the 1980s – with a solid white line, and intermittent cycle symbols. Far from perfect, certainly, but enough to make it reasonably clear to users that cycling and walking should be expected to use distinct parts of this path. If you are walking on the right hand side, you should be able to do so in peace, free from interactions with faster-moving people who are cycling. All this has been undone, however, as a result of the Royal Parks’ misguided interventions. The distinction between walking and cycling has been removed, and on the remains of the cycle path, ‘Pedestrian Priority’ symbols have been added. The result – an entirely predictable result – is that people are now cycling across the entire width of the Broad Walk. By removing distinction between walking and cycling, the Royal Parks have converted what used to be cycle-free walking space into a space that has people cycling in it, entirely innocently. Presumably the Royal Parks’ intention, with these measures, was to make walking more pleasant, by attempting to ‘control’ cycling. But, in my view, the exact opposite has been achieved. By removing distinctions between walking and cycling, they have created paths where pedestrians are having to deal with people cycling around them, in unpredictable ways. It’s surely the exact opposite of what anyone walking here would actually want. I dearly hope the Royal Parks start paying attention to how cycling is designed for in some of the photographs at the start of this post; with wide paths, clearly separated from walking, to remove conflict. It simply doesn’t make sense to push the two modes together. A few days ago, I was descending a hill towards a t-junction – a hill steep enough for me to be cycling at over 20mph. I could see a queue of ten or so cars already waiting at the junction ahead of me, waiting to join the busy main road – a habitual queue at this particular junction. Just as I begin to think about applying the brakes as the tail-end of the queue approaches, a dark, large BMW SUV appears on my right hand side. I shake my head slightly at this pointless overtake, and tuck in behind it. But before I even have a chance to dwell on this irritating bit of driving, another car appears on my right hand side – a grey-ish VW Golf this time – and as well as being pointless, this overtake is actually dangerous, into overcoming traffic, so close that the driver is forced to chop sharply back to the left, before immediately applying the brakes to join the queue. This kind of behaviour is so familiar, it even has a name, and an abbreviation – Must Get In Front, or MGIF, tunnel-vision on the part of drivers who feel they simply have to overtake regardless of the road context, and despite the fact the overtake actually serves no purpose at all. By this point I was approaching the main road, some distance away, and the stupidity of the comment really didn’t suggest it was worthwhile ‘engaging’ further. I went merrily on my way, dwelling on the thought process behind such an outburst, and a response I could have made. As is always the way, the perfect response arrived a few minutes later, on a quiet lane a mile away. Laden with sarcasm, because of course this driver didn’t care about my safety – if he did, he wouldn’t have engaged in a lunatic piece of driving that put him, the oncoming driver and most of all me in danger, yet gained him absolutely nothing at all. So why did he tell me to wear a helmet? Because I was in his way. Because he was fuming about me, and because he was angry at me, and when you don’t like someone and what they’re doing – in this case, riding a bike on a road, in front of a driver who wants to ‘make progress’ – you look for reasons to object to them, and what they are doing. A lack of helmet was the most obviously objectionable thing about me. Doubtless if I had been wearing a helmet, this driver would have told me to ‘pay road tax’, or to have a number plate, or to wear a bright yellow tabard. But none of these demands is actually about safety. It’s about punishing people cycling around, in the hope that they’ll get out the way, or go away completely. However much safety equipment I wear, however much tax I pay, however trained and competent I am – even if I’m displaying a massive identification plate with my name and address on my back – I will still be a source of irritation, and people will still look for that next restriction or rule to lumber me with, in the hope that I eventually disappear. I was already coming to this conclusion – this post was already half-formed in my drafts the day after this incident – when the deluge of reaction to the Charlie Alliston case arrived. Note that this prosecution hinged fairly straightforwardly on the absence of a front brake. The prosecution case was that (rightly or wrongly) Alliston would have been to avoid the collision with a front brake. But the absence of a front brake is something which is already illegal, and will remain illegal. There’s no need to pass a new law requiring the riders of fixed wheel bikes to have a front brake, because… that law already exists. So, to put it charitably, this doesn’t immediately strike me as fertile ground for launching a whole series of new restrictions and rules on cycling. Yet that has been the reaction from many quarters, an unseemly pile-on to legislate against ‘them’ (and it is always ‘them’, never ‘us’). In the words of CityCyclists – opportunistic grandstanding. Whether it’s compulsory training, compulsory insurance, compulsory hi-viz jackets, or compulsory helmets, the Alliston case has been the trigger for an outpouring of of grievance, all aimed at punishing cycling in general. To be clear, this isn’t about safety at all. There has been no indication that any of these things would have prevented the fatal collision last year – instead they rest on a stereotype that cycling is ‘out of control’ and that, by loading it with restrictions, it can somehow be brought back under control, or better yet, restricted out of existence. Although he is perhaps the most extreme example of this mindset, it’s instructive to look at the writings of Nick ‘Mr Loophole’ Freeman in the wake of the Alliston case. It’s therefore no surprise that if we examine Freeman’s witterings, they all involve loading restrictions onto cycling; restrictions that have absolutely nothing to do with the Alliston case. Mr Freeman said due to widespread initiatives aimed at getting people out of their cars and using other forms of transport – coupled with rising fuel costs – there needs to be a change in legislation for cyclists. In addition to abiding by all traffic signals, he said it should be made law for all cyclists to wear helmets and hi-visibility clothing. Note that this is explicitly (and bizarrely) framed as a trade off – ‘my fuel costs are rising, therefore you should be punished too’. If we apply this to any other mode of transport the ludicrousness is transparent. Perhaps due to the rising cost of bus fares, there needs to be change in the law for motorists – that in addition to abiding by all traffic signals [hello ‘Mr Loophole’] it should be made law for all motorists to wear five-point safety harness and to coat their cars in hi-viz panelling. These calls for ‘legislation’ make sense only in these terms – it’s an attempt to penalise someone else’s mode of transport, a mode of transport that is a source of resentment and jealousy (indeed, it’s notable that banning people from cycling past stationary traffic frequently crops up in these kinds of calls for legislation). It’s the crab mentality writ large – my mode of transport is frustrating, so your mode of transport should be too. Your mode of transport is increasingly taking up road space used by my mode of transport, so if we make it more onerous and unpleasant, that might even up the scales. These calls for legislation aren’t about safety at all. They’re about resentment and punishment, punishing a mode of transport that is unorthodox, that gets in the way of other modes of transport and is in conflict with them. We should see those calls for what they are.